Caroline's recent comments during the heatwave are well placed but it shouldn't take such an event to trigger people's awareness, especially as that once the event has passed they will forget it. But climate change is starting to bite and we must not only not forget it once the heat breaks but we must redouble our efforts to prevent it getting worse. But there is an increasing sense of hopelessness, triggered for example by pictures of the northern hemisphere heatwave and the news that crops are struggling after 7 weeks without rain (coupled with the need to stockpile for April 2019 post Brexit). The sense of impending collapse grows with every tragic climate story in the media. While there is a fairly solid likelihood of climate / ecological collapse, I suspect collapse in some way, shape or form is exactly what we need. There is little else that will jolt the likes of some into grasping the reality that humanity has spent the past 150 years burning millions of years of stored sunlight and pumping the resultant CO2 into the atmosphere. The ecological collapse will prompt an economic collapse too, just as parts of Africa has seen but much wider. We urgently need degrowth, i.e. some form of economic retreat rather than a collapse which would be painful. Remember that currently our global economy currently needs 1.7 planets to support it. The key is how to rapidly reduce our collective footprints so that the collapse is a orderly retreat rather than a full scale cataclysm. My favourite (albeit a bit right wing at times) writer, John Michael Greer, uses the phrase: "Collapse now and avoid the rush". We need to be building communities that are in rapid retreat and that will be resilient in the turmoil ahead. Of course if the majority of people across the planet collapse early enough then the climate chaos might just be less as result. But to do this we need climate leaders - Greens like us. 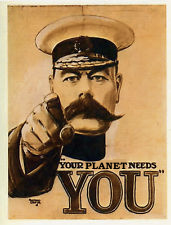 While I obviously have a bit of a problem with WW1 propaganda generally, this does send a message and our planet really does need us to act.